The project consists of an existing sports pavilion that will be converted to lecture theatres and the construction of a new building containing lecture laboratories for undergraduates in Chemistry, Physics and Biology. 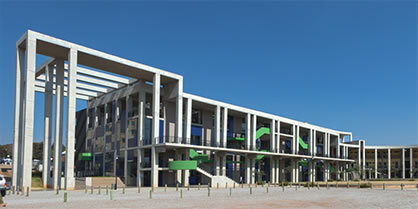 Daylighting principles and our analyses were drivers in the architectural design. After evaluating a number of design interventions, the lecture theatres are naturally lit with a roof light strip from behind the audience for the most favorable combination of daylight availability and glare control. Intrinsic to the laboratory spaces is the high ceiling which allows placement of fenestration at high level for deep penetration of daylight. For many of the laboratories it was possible to have fenestration on both sides of the space balancing potential contrast. 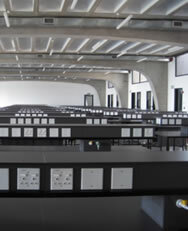 With an additional lighting control zoning and logic closely coordinated with Aftek Consulting, the potential energy savings are in the order of 40% to 85% dependant upon zone. A troughed slab was explored both for its material saving potential but more interestingly for the exposed thermal mass that can be used for cooling (and heating). Structural cooling uses the thermal mass and radiation heat transfer between heat sources (including occupants) to maintain comfort conditions rather than just trying to condition the air itself. The mass of the structure is cooled and heated according to season by water in pipe work within the structure itself. Water is a more efficient energy carrier and less energy intensive to move through a building resulting in less pumping power than fan power for the same effect. Maintaining surface temperatures allows more leniency with regards to air temperature. The result is a high degree of thermal comfort even when air temperatures rise higher than conventional air conditioned space. This design was carried out with Spoormaker and Orenge Engineers.